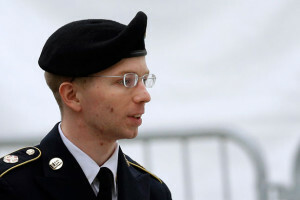 Today [3 June 2013] begins the court-martial of Private First Class Bradley Manning, WikiLeaks’ source inside the US military. Because Manning was arrested over three years ago, the global news media have already written much about the young soldier from Crescent, Oklahoma. And though news accounts have frequently gotten the facts right (he’s 25, was deployed to FOB Hammer in the Mada’in Qada desert of Iraq, is 5 foot 2), most reports have written about the big issues that collide in this case without the slightest sense of context and perspective, leading to all kinds of basic errors and distortions—for instance that the leaks were “top secret”; that WikiLeaks is on a “utopian” quest for “total transparency,” that Manning did what he did not for political but for psychological (or sexual!) reasons. As Pfc. Manning’s court-martial proceeds over the next three to four months in Ft. Meade, you can bet that media reports will continue to put across the same funhouse distortions. So to kick off my blog coverage of the court-martial for The Nation, here’s a quick debunking trip through the thickets of folklore that have sprung up around this case. On the level of straight fact, there is the common, false assertion, Myth #4, that Bradley Manning leaked “top secret” material. It is true that Pfc. Manning did enjoy top-secret security clearance, a distinction he shared with the 1.4 million other people who are eligible for Top Secret security clearance. (And how, by the way, can any secret accessible by a population the size of all of Vermont and North Dakota together, a group larger than the population of Washington, DC, itself, be a secret?) It so happens that not a single one of the documents that Pfc. Manning declassified was “top secret” status. (By contrast, every last one of the thousands of documents comprising the Pentagon Papers was Top Secret, yet many of Manning’s critics claim to love Daniel Ellsberg.) More than half of the diplomatic cables are not classified in any way, and neither was the infamous helicopter gunsight video that shows an Apache gunship slaughtering a dozen Iraqis, including two Reuters news agency employees. Although the US government has not embraced much responsibility for the hundreds of thousands of Iraqi civilians who have died in the past ten years, it is frequently assumed (Myth #5 ) that Manning’s leaks have gotten people killed or at least damaged US national interests. But in the three-year span since these leaks came out, there is no evidence of a single civilian or soldier or even spy being harmed by the documents’ release. (I’ve written at greater length for TomDispatch about the accusations of Manning and WikiLeaks having “blood on their hands” come loudest from the same pols and hacks who backed the Iraq War and Obama’s Afghan Surge.) Yes, two US ambassadors were recalled from Latin American countries, but this is hardly the diplomatic Armageddon that then–Secretary of State Hillary Clinton luridly promised us. Chase Madar is a civil rights attorney in New York and the author of The Passion of Bradley Manning: The Story behind the WikiLeaks Whistleblower (Verso).